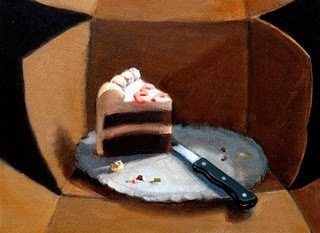 When it comes to painting still lives, cakes and baked goods are really the ideal subject matter: they won't talk back, they'll always look good, and their frosting and textures lend themselves to beautiful interpretation with a palette knife or even a whimsical line. 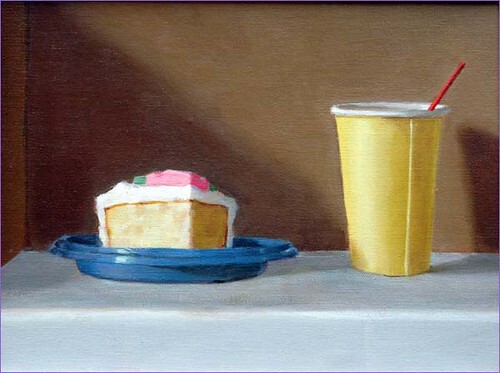 Thiebaud knew it. Warhol knew it. 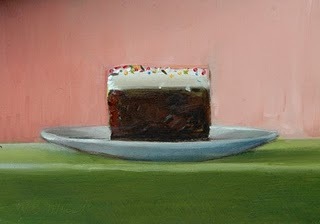 And now we've discovered some gorgeous new cake artwork to obsess over: that of Nancy Bea Miller. 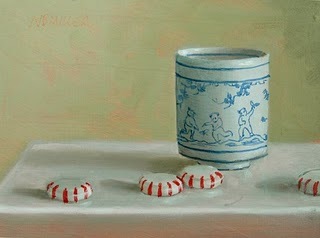 Miller's work, which is realistic and vibrant in color, shows a true sensitivity to her subject matter: the viewer sees not only a cake, or a baked good, but is led to wonder about the story behind it--where did these sweets come from? Where are they going? Cakespy: First off, you currently have a show coming up. Can you tell us a bit more about it and what type of paintings you'll have in it? 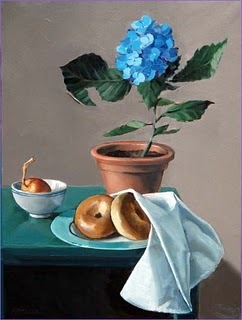 Nancy Bea Miller: The show is called Still Moments and it is all still-life paintings and landscapes. Mostly still-life. 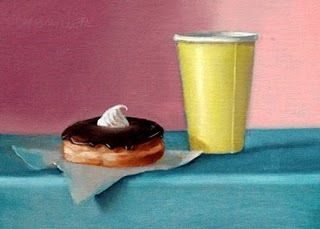 Many of the still-life paintings feature baked goods and candy: items that attract me visually and also symbolize many things to me: pleasure, indulgence and the sweetness of life.The common denominator in all the paintings is the capturing of a quiet moment, a pause, even an overt invitation for contemplation. I asked friends and families for show title suggestions and one of my sister-in-laws and one of my best friends each independently came up with Still Moments, which I thought was brilliant: descriptive but economical. CS: We know where you went to school, etc, but we're curious on a more personal level: why are you a painter? Or what drew you to painting? NBM: Wow, what a good question! In general as I understand it Sigmund Freud believed that the creative impulse is a form of mental illness , a sort of internal imbalance that creative people feel the need to correct through artistic output. This may or may not be true, who knows? But in my own case, I simply grew up in an artistic family. My parents met while taking night classes at the Art Student's league in New York. My father and both my brothers are professional artists, and I have several other extended family members who are artists, photographers or writers. Perhaps we all share the gene for that internal imbalance Freud talks about. CS: What is your primary medium when painting? NBM: Oil paint. I have tried acrylics and watercolors but like oil paint the best. I'm attracted to gouache, but haven't yet tried it in a serious way. CS: You mention that you often have an intimate connection with the subjects of your paintings. 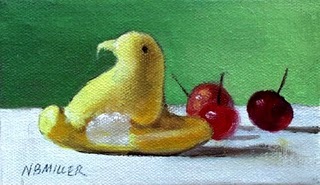 Is this true of your still life / baked good work as well as with your human figures? CS: What is it that attracts you to baked goods in particular as your subject matter? 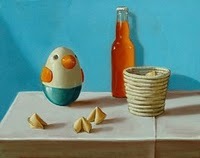 NBM: Sweets and pastries are visually very appealing, real eye-candy and unashamedly designed to be so. 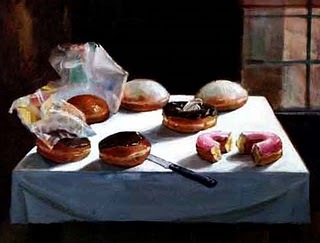 To me they are also physical manifestations of the idea of the sweetness of life, and luxury, and plenty (you don't get Boston Kreme doughnuts in a society that is struggling with famine, do you?). The candies, especially the red and white striped peppermints (also called Starlite Mints) are a reminder to me of my mother's parents. They'd keep little dishes of mints in their apartment and we grandkids would be allowed, even urged, to indulge! What a treat, especially as my mother was into health food and didn't allow much sugar in our own home. So I like to put the mints in, as reference and homage to my grandparents, like little symbols of unconditional love strewn around the universe. CS: When you sit down to do a painting, is it something that you'll work on start to finish in one shot? Or, is it something that might take weeks of work? NBM: I rarely do a painting in one shot, or alla prima, except when I am out in the field, doing plein air landscape paintings. Those are small, for portability sake, and are made mostly for study, so I am not concerned with their ultimate presentation, although sometimes by chance they are complete enough to be called finished pieces! That's always fun. In the studio I work on lots of different paintings, at the same time. I have five different tables of varying heights arranged with one or two different still-life set-ups each. I also do some figurative work, portrait commissions etc, and that is mostly done from photos. I'll work on one piece for a while, set it aside to dry, work on another etc. I like to work in layers, rather than wet-into-wet, so it takes time to complete a painting because I have to let the pieces dry between sessions. Drying time varies depending on the thickness of the paint I've applied, and the colors, too (whites and reds being the slowest drying, earth colors the fastest drying.) I am sometimes slowly working my way through a dozen different paintings, all at different stages of completion! Although this might seem confusing to others, it isn't to me. I prefer it to concentrating only on one piece till it is finished. For one thing, working on a variety of things at the same time keeps my interest fresh in each of them! CS: I feel like many painters have a natural size that they tend to work (literally, like canvas size)--big, small, etc. Do you find this is true? What size do you generally work? 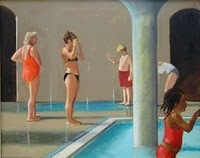 NBM: I work in a variety of sizes, the Still Moments show has pieces starting from 4 x 6 inches, up to 28 x 44 inches. I'd say my average size is about 16 x 20, or 20 x 24. I actually love painting bigger than this, too. In my last year of art school I was lucky enough to be assigned a very large private studio and I gradually started to work on canvases taller than myself (I am close to 6 feet tall) I loved the energy and physicality required! Unfortunately, another thing that is required is space. My current studio, a room in my house, is small, with a fairly low ceiling. In this space, a 28 x 44 inch canvas feels like a boat, and requires careful maneuvering so I don't knock down my still life set-ups or bash into the other paintings lining the walls, awaiting their turns at the easel. I also have time constraints...I am a Mom of three boys in elementary and midddle school, and a large canvas requires large amounts of time to complete. This has also dictated my working on smaller sized canvases. Not that I am complaining! It's just interesting to see how environment has such a direct impact on one's aesthetic choices. CS: Do you eat the cakes or candy after painting them? NBM: Hah! No, they are usually almost petrified by the time I have applied my last brushstroke. Baked goods hold up amazingly well over time, especially those with lots of chemicals and preservatives. Sometimes a slice of cake or a doughnut has stayed so fresh looking, despite being weeks old, that I'll set it aside for future use! I do have to keep my studio door locked to keep out my children. One of my sons has autism and severe mental retardation and is unstoppable in his constant quest for sweets. If he gets into my studio he will start chomping down on old gluey candies and ancient doughnuts which shatter as he bites into them! Not that that stops him...sugar is sugar as far as he is concerned! 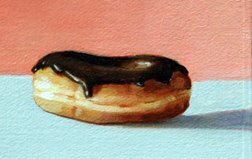 CS: What is your favorite baked good to paint? NBM: I'd have to say doughnuts. There is something so comical and approachable about a doughnut. And I love the way the shiny icing drips down the sides. 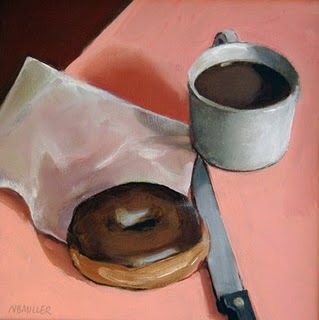 A local art writer mentioned my work in some article and called me "the foremost doughnut painter in Philadelphia." I think he really meant it as a kind of back-handed compliment but it thrilled me to the very marrow! CS: What is your favorite baked good to eat? NBM: What a question! So many answers. My favorite cake for someone to make for me is a homemade white cake with (almost dark) chocolate buttercream frosting. And if there are violets pressed into the icing as decoration, so much the better! From the local french bakery, I particularly like a pastry called an opera (in fact, I did a painting of one in this show!) But to be completely honest...my favorite baked good is bread. Bread of almost any kind. Fresh or toasted. With butter. To me this is heaven. I was just reading some French food writer who, commenting wonderingly on the current low-carb craze that still gripping the US, said "Life without bread is cruel." I completely agree! CS: Do you have a favorite bakery in your area? NBM: Yes, it is a small patisserie called Le Petit Mitron (the small baker's boy), run by a french couple from the Versailles area. Incredibly high quality. I was just in France recently, and although the food there was wonderful, I did not taste a pastry or croissant that seemed in any way superior to those in my local french bakery. Incroyable! 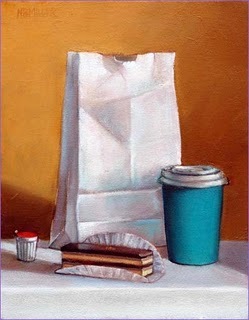 But I also frequent our local Dunkin' Donuts when shopping for subject matter! There's something almost lascivious about picking out the ones I want to paint...I'm sure the counter folks think I am a little insane. "No, not that one, the one on the far left with the big dollop of icing running down...yeah, that one! Thanks!" CS: Going away from baked goods for a moment, you also have a very interesting and meaningful project going on right now, the Genre of Inclusion. Can you tell us a bit about that? NBM: The Genre of Inclusion is an ongoing, long-term project. As a mother of a child with special needs, and an artist, i became aware of how rarely people with special needs are included in a natural way in contemporary paintings. 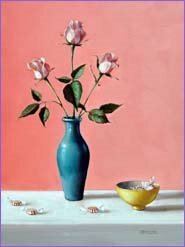 If you see them at all, they are usually the focus of the painting, and often their disability that is the real focus of the painting, not them as a person. I found this condescending and annoying, and decided to do something about it through my own art. I created the concept of the genre of inclusion from the terms genre painting, meaning paintings of people in ordinary life, and inclusion, which in special education means to include people with special needs in regular classrooms (with appropriate supports.) So, the paintings are just of people doing ordinary everyday things and some of the people have special needs and some of them don't, and maybe you can tell and maybe you can't. This project has been very successful in terms of grants and fellowships and magazine articles, but is of no interest to the commercial galleries that represent me. So I'm finding venues for it like local art centers and schools. So far I have had two exhibitions of the ever-changing body of work (Only Human and Only Human ll) and I have another show scheduled for the spring of 2009. CS: If interested, where can your work be purchased? CS: What is next for you and your painting? NBM: I'm planning to paint a brioche: all puffy and mahogany brown and shiny! ;-> Of course, the biggest thing on my horizon currently is the opening reception for Still Moments this Saturday in New York. Please come if you are in the Chelsea area! After that, I will have relatively quiet summer, working towards a small show in Philadelphia in September at Artists' House Gallery. And I am very excited about this next chance to exhibit the Genre of Inclusion project, in the spring, and I'll be working on several new pieces for that. That show will be held in Devon, PA. Please e-mail me if you'd like to be on my mailing list (occasional postcards and/or infrequent email updates) You can also always check out the news site on my website. Are you in NYC? Well, lucky you, you can check out the upcoming show (and reception!) for Nancy's newest show; details below. 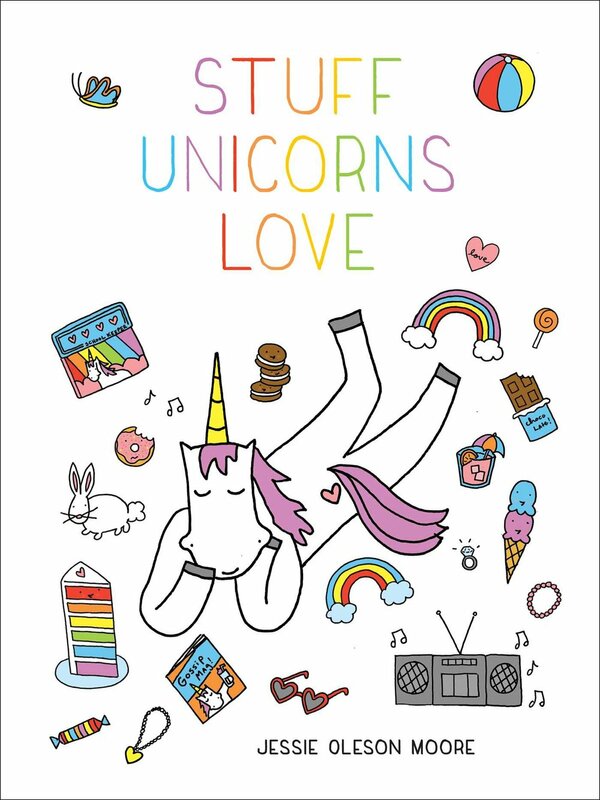 But even if not in NYC, you can enjoy Nancy's work online at nancybeamiller.com. at SHERRY FRENCH GALLERY, INC.